I don't get it - I just don't. Josh Baskin played by Tom Hanks in Big said it best for me. I don't get it. 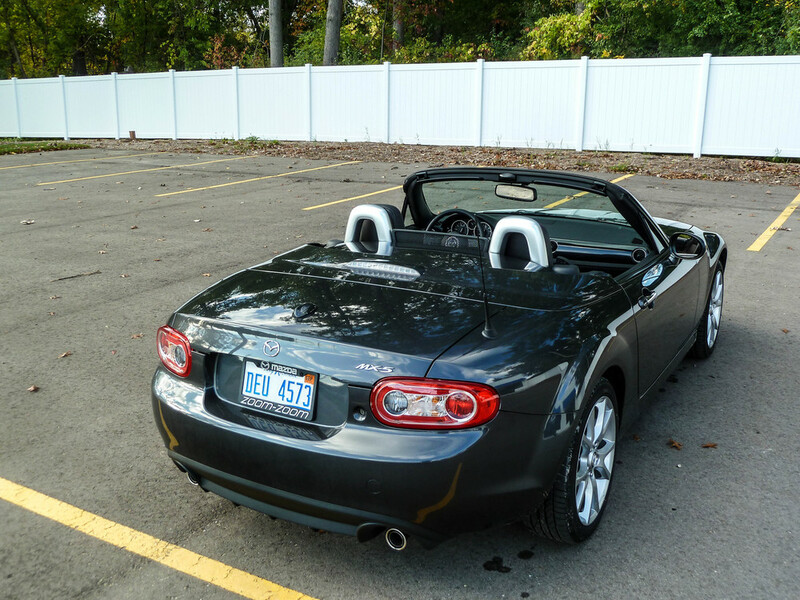 The Mazda MX-5 or Miata... Well known by many as the hair dressers convertible, the midlife crisis mobile, and of course savior to the universe by every person who has ever written for Jalopnik. Mazda gave me the opportunity to road test the infamous MX-5 for the weekend. My excitement was super high and that's because I've never even sat in one before. I've seen them at track days, heard how great they are, and also chuckled a bit when I see the right or wrong person driving one. Whatever my perceptions were though, I threw them out and got myself excited. 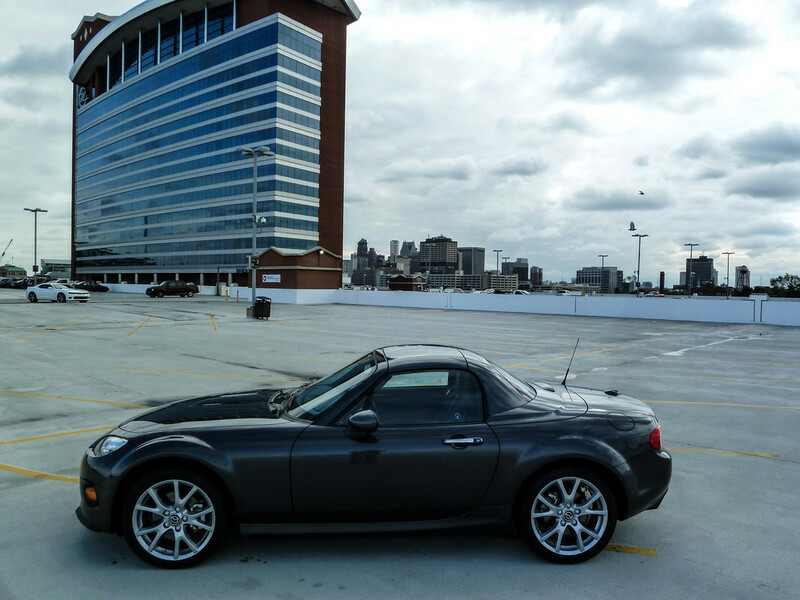 The top of the line model was waiting for me - Grand Touring, six speed manual, Spicy Mocha leather interior, power hard top, Xenon headlights, Bilstein Shocks, limited slip diff - Pretty much everything that I would want on the MX-5 if I were to purchase one. As I started to drive this vehicle though, my excitement wore off quicker than I thought it would. The MX-5 has always had a quirky look to it in my opinion, somewhat Mini Cooperish but not as ugly. When this model came out back in 2005, Mazda said everything was new or radically different. That's fine - I remember thinking back then how much better it looked and also how it sort of grew up in the third generation. If we are going by looks alone, I feel it still is solid and useful. The flared wheel arches are so cool and the fascia update from 2013 looks quick sitting still. The panel gaps are a bit big by today's standards, but those sort of things aren't on my priority list for a car like this. With the power hard top, this MX-5 did the job for me in the looks department. We all know the new model is coming in 2016, but for this departing style, it really still looks fine and not out of date. Mazda has done a nice job keeping it fresh with subtle tweaks over the past decade. Getting inside one of these things for the first time, I was somewhat surprised. I didn't myself struggling to climb in and out, it felt pretty much like a normal sports car. The main issues I found resides back in 2005. 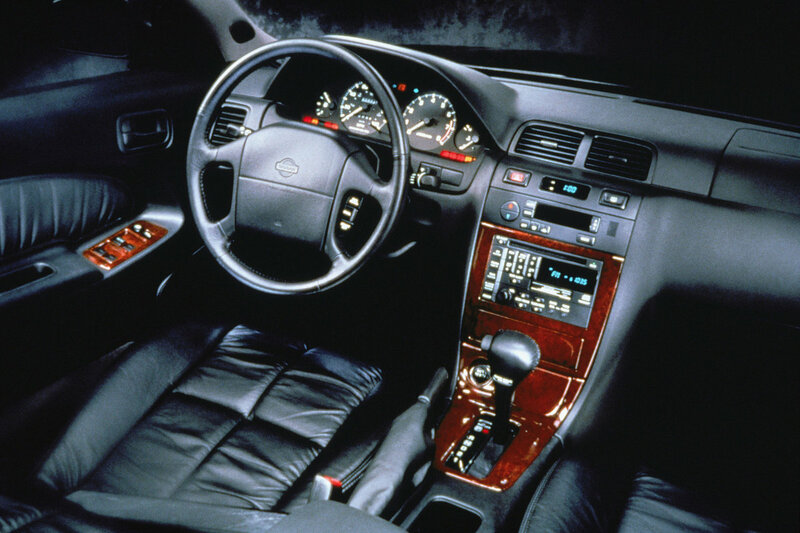 This interior feels dated, and I'm not talking about the seats, they were solid and supportive with nice leather surfaces. The radio, controls, dash, and everything else looked ten years old. For me, it hasn't aged well - I know that the new model is coming, so why waste the money refreshing an outgoing unit? Some of the pieces though... I feel like they were dated in 2005 when they were brand new. 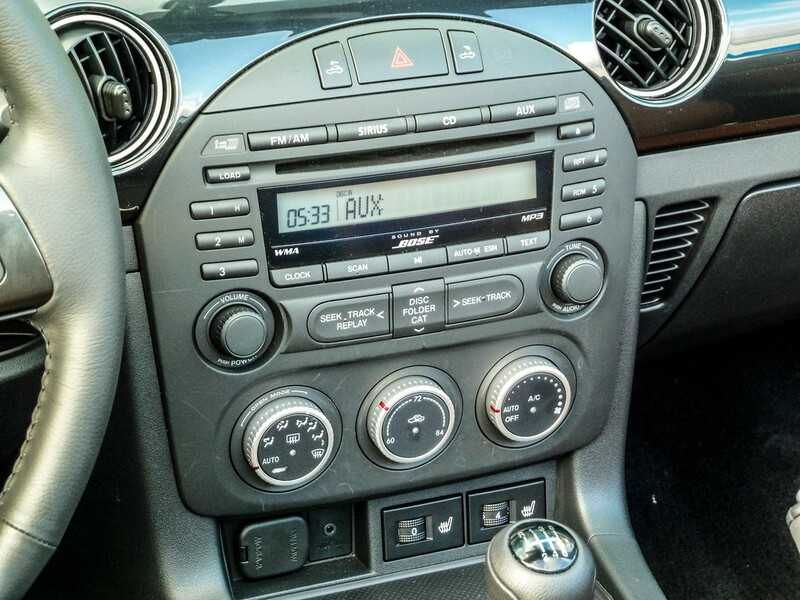 The wiper stalk, the radio screen, the Bluetooth system, and even the door lock buttons. I seriously felt like I was in a late 90s Nissan. Another item that was surprising was the sound once inside. This is supposed to be a minimalist vehicle, but with the top and windows up it really felt like sitting in a 2004 Jeep Wrangler with the plastic oem hard top. It's that sitting inside an Igloo cooler feeling you only know if you've driven a Jeep. The keyless ignition was interesting too, because you can tell they've just adapted keyless to an existing regular key slot. You still turn the ignition on the column, but the key remains in your pocket. Just kind of weird without a push button start. One final gripe... How does anybody over 5'6" fit in this thing? I fit fine for the most part, but my knees kept hitting the steering wheel whenever I would touch the brakes, and this was after adjusting the seat and steering wheel twenty times looking for a remedy. The drivers area was cramped I guess you could say, for me being 6'0''. 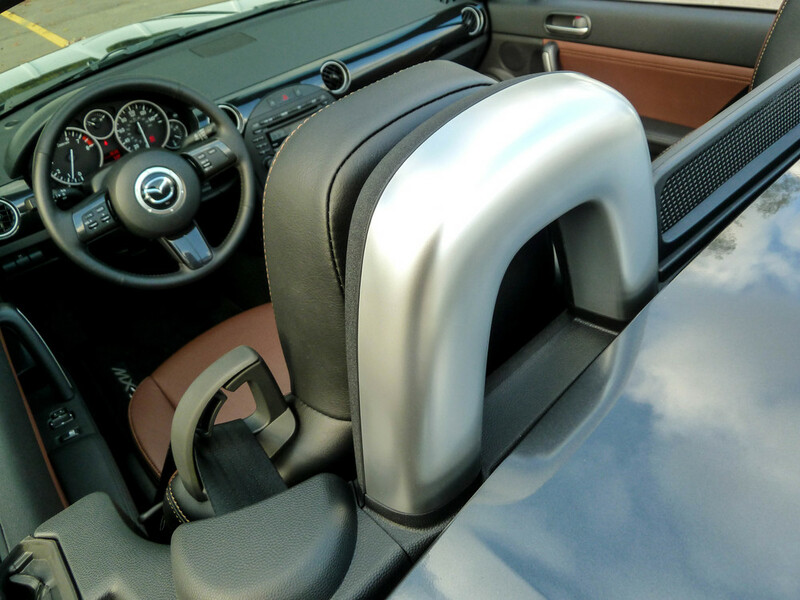 So I get this part of it, you aren't buying an MX-5 for comfort or features. The features do exist, but they are dated and ready for a change. I do feel though that in 2005, this interior just barely squeaked by. For the amount of money this little guy costs though, I really would be disappointed if I bought this brand new in 2015. 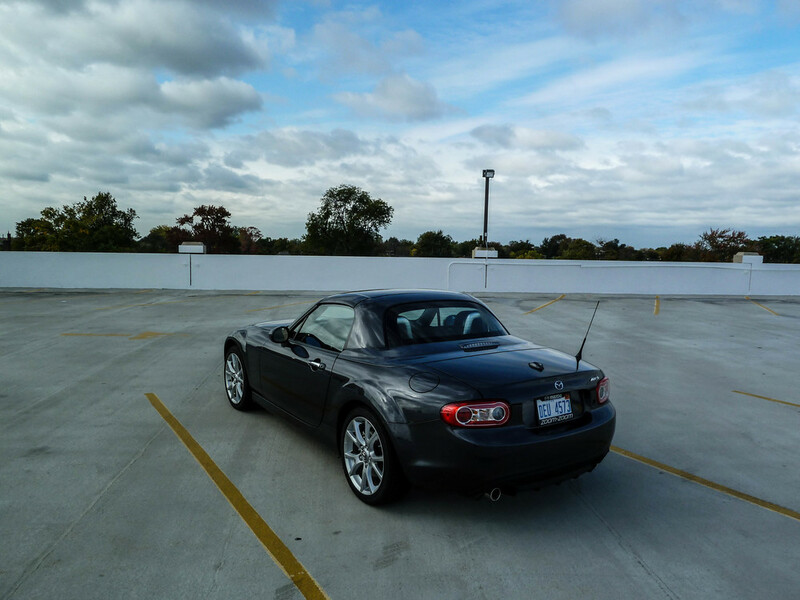 The point of owning an MX-5. The drive. Everyone who is anyone raves about this thing. The Miata fixes everything and is the answer to every problem known to man including immigration, universal healthcare, ISIS, Ebola, and of course feeling old. This is where Josh Baskin comes in again... I really don't get it. I have owned multiple LS engine vehicles, driven many varieties of sports cars, participated in track events and even done some time in the dirt off road. Personally, I feel that I somewhat know what I'm doing and my experience in driving is up there. For this thing though, it flat out was not enough. Right off the rip, I tried to do some spirited driving, banging through the gears, stuff anyone in an MX-5 would do. My initial impressions had me to loving it. The shifts were smooth, it made a fun noise, and it loved to rev. 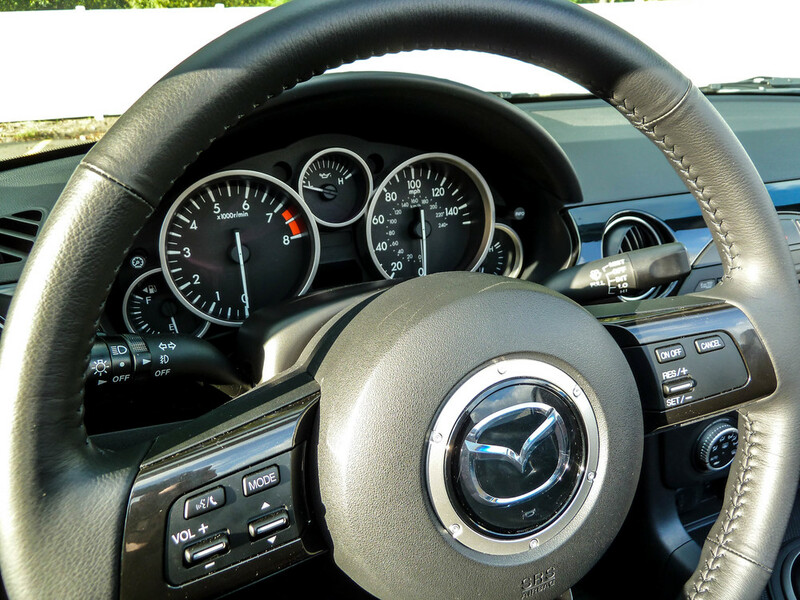 Then I looked at the speedometer.... After all that work of shifting through multiple gears, I felt like I had to split the atom to get the MX-5 up to 40mph. Shifting, clutching, over and over - and the thing just didn't move. I get that this doesn't have an LS7 under the hood, but I've driven Mini Coopers that felt quicker and torquer than this. I will concede to the fact that we didn't have it on a track - maybe all the heavens and stars would align if we were to take it to the natural habitat. For daily driving though, it took so much effort to get it anywhere I wanted it to go. The ride was as rough as a vehicle with full urethane suspension. Even on tight turning off/on ramps and around random corners, the thing just made me feel like... I wish I was going faster. For me, the excitement was missing if that makes sense. I guess it just didn't wow me like I thought it would. You could say I'm doing it wrong, or maybe that I just don't get it. I seriously don't have any issues handling 400hp around a track. I really find the MX-5 be a little juvenile, safe, and even wimpy. I would trust this with a brand new driver because it's no faster than an ultra safe low buck Subaru. You can have your excitement on the track with the MX-5, I'm sure of that. I just know it will be nearly half as slow compared to something that actually has some power, and that includes a V6 Malibu. Can that be fun? Yes of course - But I can seriously think of about 10 cars, new and used, that I would enjoy so much more on a track and daily driving. The biggest problem is... All 10 cost less than the MX-5. The legendary Mazda MX-5 exhaust note. I can respect any car, for any person and any style of driving. If a red Kia is your thing, great, go for it. I'm sure it will be a great car for you and you'll have so much fun driving it. 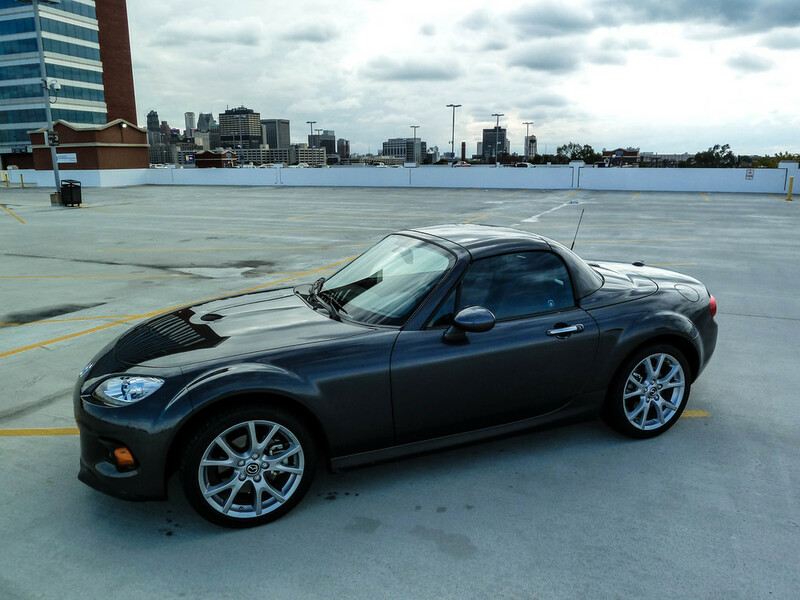 The Miata though always gave me this impression that it'd be fun and exciting, before this review. There had to be a reason people bought them and why the interwebs love it. Power sliding at 15mph and taching out an engine and not going anywhere though... isn't my idea of fun. I would much rather feel raw power and torque, actually propelling the car to stupid fast unsafe speeds instead of buzzing by in a car that is slower than something my grandma drives. That is me though. Maybe that sort of thing is enjoyable and exciting to you if you are coming from that red Kia I mentioned earlier. Coming from what I have seen and driven though, this thing was really underwhelming and in all seriousness, I couldn't wait to get out of it.